By writing in the language of all Jews about everyday Jewish life, Sholem Asch, along with other pioneers of Yiddish literature, sought to preserve a sense of culture and community among his kinsmen despite their dispersal throughout the world and lack of a common homeland. His literature appeared at a time when Jews were stigmatized and persecuted for their culture and religious beliefs. His stories of ordinary men and women living in Eastern European shtetls and American settlements and their triumph of spirit and faith in the face of adversity transcended religion, culture and nationality. Certain Jewish critics, however, found some of his work disloyal and sacrilegious. Born in Kutno, Poland in 1880, Asch began his career when he moved to Warsaw at age 19 and became a pupil of Isaac Leib Peretz, a founding father of Yiddish literature. Four years later, Asch's prominence as a Yiddish author was established with the publication of his novel, Dos Shtetl or The Town (1904). Where some saw only filth and unenlightenment among the inhabitants of Jewish enclaves, Asch wrote of the beauty, tradition and charm within. His tragedy, God of Vengeance (1907), tells of a father seeking to protect his daughter from the immorality of the brothel that occupied the lower floor of their dwelling. To do this, the father places a Torah scroll in her room in hopes that the holy writings would guard her from the sinful activities below. The play, although well received internationally, was repudiated by those who considered the father's act a defilation of the Torah. Asch's Christological trilogy—The Nazarene (1939), The #39tle (1943) and Mary (1949), which are novelized accounts of the Gospels—prompted some Jews to allege that he had renounced his faith and turned his back on his fellow Jews. His detractors felt that the publication of the first two books during the Holocaust, at a time when Jews were being put to death for their religious beliefs, promoted antipathy toward Jews. Asch said he intended to do just the opposite. Such rebuke distressed Asch, who took little comfort in his continued popularity among non-Jews. During World War I, Asch lived in the United States, where his brothers and sisters had settled. 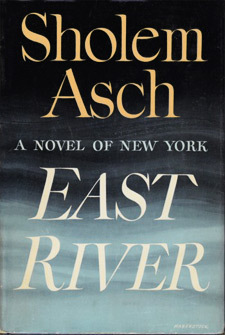 His experience led to several novels, including East River (1946), which chronicled the efforts of Jewish immigrants to adjust to American life in New York City. Called a "novel of the American spirit" by The New York Times Book Review, East River tells a story about enmity and eventual harmony among immigrants of different religions and cultures living within a community on Manhattan's East Side. The issue of marriage between a Jew and a Catholic surfaces, and the potential union speaks to Asch's hopes of what his work of some sixty volumes might serve to accomplish: a rapprochement between Jews and Christians. Asch died in London in 1957.